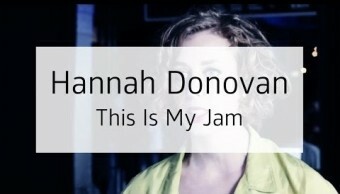 HHannah Donovan is co-founder and design director of This Is My Jam – a music service for sharing song you are into the most right now. Before starting Jam, Hannah led design at Last.fm and has been working at the intersection of music, design and technology for the last decade. In this Stand Above The Noise interview, Hannah shared her thoughts on the state of design in the music industry and importance of visual representation of an artist. She also talked on the latest This Is My Jam updates and how musicians use it as a social network to engage their fans. 00:00:46 – What’s the state of design in the music industry? 00:02:34 – How important is the visual component of an indie artist’s brand? 00:07:01 – What’s This Is My Jam? 00:08:37 – What are the latest updates on the platform? My name is Hannah Donovan and I’m a product designer. I make digital products in music. Currently, I’m working on a project called This Is My Jam where I’m the co-founder and the design director. And previous to that, I lead design AtLast FM. And I also at the moment am bootstrapping This Is My Jam with a design consultancy at the side and I have clients in the music and entertainment industry. So I’ve been working in music since 2006 as a designer and my opinion is that, in general broadly speaking, the music industry loves design. It’s ripe for design. When you look at the some of the amazing visual aesthetics that have come out of everything from album covers to concert graphics to all those stuff. The music industry itself is synonymous with pop culture and entertainment and of course out of that comes all sorts of visuals, right? However, I think that when you look at the tech side of things, like the music tech industry specifically, when it started it was a little bit naive, graphic design in particular. And if you look at some of these services from let’s say around the early 2000s, the design was not nearly as beautiful as some of these old traditional bastions of design in the music industry like magazines or journals and that kind of thing. Now I think what we’re seeing is the maturation of the online music industry. We’re seeing much better design there than ever before and I think it’s a really exciting time right now for design in music because we’re slowly starting to see the marriage of 2 streams. Like people from maybe more of a traditional editorial background that really understand the necessity of beautiful visuals and photo shoots and album art. We’re starting to see those people work more hand in hand with the people that come from the background of big data and online music and technology. And I think when you bring those 2 things together, we’re going to see really beautiful creations happening. And that’s already sort of starting to happen but I think that the future just holds more of it. As an independent artist or an artist starting out, I think it’s hugely important to have a strong visual identity because music is only as visual as you make it, you know. Music is oral but it’s really hard to market it if there isn’t a visual that helps people understand what it’s going to be about. And the amazing thing about the visuals of music is you get a sense of what it could sound like. Is this experimental? Is this dark? Is it happy? Is it sad? And all those things are so important because otherwise it’s kind of hard for people to know what your music’s going to sound like. But sadly I think that a lot of musician’s maybe underrepresent themselves this way. And the visuals end up becoming a bit of an afterthought to them. I also think that it’s sometimes very difficult to find a really good designer or a really good artist to work with that can help you with this as a musician. And yeah, I’ve often thought that it would be really cool to have a better network that could pair indie artists like musicians with indie designers because of course also that’s a designer’s dream project, right? But it goes beyond just the art and the visuals and the album cover. It’s so much more than that these days. It’s about your online brand, it’s about having the same name across all these different services, it’s ensuring that your visuals are presentable in a number of formats so that you can upload them to Soundcloud, so you can use them on Band Camp, so you can stick them wherever they need to go. You need to have stuff that’s full screen and big and beautiful for retina display, Ipads and Iphones, but you also need small little thumbnails. You need to ensure that you’re really searchable and easy to find online and that your name doesn’t cross paths with anybody else. And so that whole area of things, that’s something that maybe traditional graphic designers or visual artists are less trained in perhaps than interaction designers or product designers. But it’s hugely important, I think. So I love what you say about people listening with their eyes first. And that’s the thing, you know. As human beings, we’re very visual people. We take in the visuals first and then if we’re interested we listen second. So it’s hugely important. The other thing is that having a strong visual culture is a way for you to have a stronger connection with your fans as an artist as well. And that’s something today that’s really important is that direct connection between the artist and the fans. And there’s all these great services and ways that allow people to connect really directly like on Twitter or on Instagram or new things that will be made or dealt. But every fan that I interview and talk to in my research as a designer, they all say that they want to have a more authentic connection with the artist. They really want to feel like they’re in the same room as the artist, and they’re having a chat, and like they really know this person. I think that’s because with digital music because it’s quite ethereal, because it lives in a cloud, because you don’t own it, because it’s on your phone and then it isn’t, it’s not the same as the old days where you could like hold a piece of vinyl perhaps and really feel like it’s yours. And so they want to have these really authentic meaningful experiences with artists and that’s one of the reasons why touring right now is so profitable because the fans can get that direct authentic experience. But if you have strong visuals, it gives the fans even more ways to interact with you and connect with you. I remember the very first time Janelle Monáe was touring in London and I was so surprised when I got there. She’s an artist with a very strong aesthetic sense of course. But there was like half the audience was dressed in black and white Janelle Monáe outfits. All these girls had these amazing tuxedos on and I was like that’s so cool. That’s amazing. That’s such a neat way to be able to connect with your audience and then you can get pictures of all your fans wearing that stuff and you can put it on your social stuff and that’s amazing. That’s a very extreme example but there’s also things like fans just wanting to make fan art and put it up on their Tumblr, up on their Instagram and stuff like that. And the visuals is another way for you to have that conversation with them. The company that I run, This Is My Jam, with my co-founder, Matthew Ogle, it’s a song-sharing site. So we were frustrated by the fact that today’s song-sharing feels fragmented, it lacks in context, and it feels as though it’s across a bunch of different places, and you read about a song on Twitter but then it falls on off the bottom of the feed, or it’s on my Facebook then it’s gone and where is it. So what we wanted to do was really create a home for people’s favorite songs because your favorite song deserves far more attention than just a tweet. So on This Is My Jam we ask you what’s your favorite song right now. You let us know. We pull in that audio from a variety of sources. We work with pretty much everybody so Soundcloud, Band Camp, Vimeo, Youtube, you name it, all those things. And then you get a whole screen dedicated to your song, you can customize it, you can make it look how you want with some really cool filters that I helped design and developed for that. A bit like Instagram and you can write a little story about it and what you get in return is a playlist of all your friend’s favorite songs. So essentially what we’ve created is a network of only the best songs to be in a very small catalogue but it’s the best. It’s only the good stuff. And by only the good stuff, I mean it’s all sorts of genres. It’s everything from Classical to Oldies to up and coming breaking tracks right now, you know the latest whatever. But it’s just the things that people find that are their favorites and so it’s a way for fans to sort of cut through all the choice in music and just get straight to the gold. So right now, our latest release was really big because what we unveiled or lit up was something called the Song Graph. So This Is My Jam has been collecting data on the best songs of all time as our users tell us which we consider to be like crowd-sourced editorial. And after two years we had 2 million jams shared. When we did duplicate those and look at how many songs there are, it’s about half a million songs. So we lit up a song graph of half a million songs. We can now tell you if you look up any artist from This Is My Jam, like this is what the best songs by that artist are as decided by our users. And we’ve created these really exciting new song pages, song screens, they just went live last week. They now show you, obviously you can listen to the song, you can love it, but really more importantly you can see who in your network is really into this, what they’re saying about it. It’s really focused on the rich cultural interactions around the music and creating a home like a canonical source and place for that song on the internet. So the next steps with what we’re doing with this in terms of opening this all up now, is we’re going to be plumbing it in to our explorer screens so that you’ll be able to search for an artist or a song directly and get to it right away. Because at the moment, we only opened it up contextually through users’ histories. So we’re going to be doing some interesting stuff there. We’re also just going to be linking up these song screens and these artist screens to more places in general across This Is My Jam. And this was actually also the beginning, it’s very kind of you to say that it looks great, but I only see all the problems with it. So we’re also working on a pretty big design refresh right now that’s going to change the playlists and the profiles and some other stuff on Jam. So this was the beginning of a rolling release of updates around the design too that will be coming over the next few months. We love it when artists use This Is My Jam. We think that it works really well for that. The artists that seem to be most successful on This Is My Jam are the ones who use it a little bit like they would Twitter or Instagram. So occasionally they post one of their own tracks but also they post music from other people that they’re interested in right now, they’re influences, what they’re playing on their Ipod and our users love that because that’s like that direct artist to fan connection. I can see what you’re listening to, you know? That’s great. And so the most successful artists on This Is My Jam do that. A really great example that I can think of off the top of my head is James Yuill who’s an artist based in London. He uses it really regularly and he’ll occasionally post his own stuff or like a remix of his own work but a lot of the times he posts other music and it’s really fascinating to see what he’s into right now.